These quotes popped into my mind during John Abbott College’s professional theatre production of June Havoc’s dance drama Marathon 33. Havoc, who was born in Vancouver and died at 97 in 2010, had a lot of early adversity to cry about. She overcame early poverty to become an actor in 29 films and 13 TV shows. She began at 3 years old as Baby June in mother Rose’s burlesque show. She morphed as a pre-teen into Dainty June but ran away from home when she was overshadowed by her domineering mother and her older sister Louise (who became megastar Gypsy Rose Lee). During the Depression she and thousands of other desperate people entered marathon dance contests for the free food as much as for the big prize. Based on her book, Early Havoc, she wrote and directed Marathon 33, which played on Broadway in 1963 with vulnerable Julie Harris as Jean, the teenage June stand-in who reluctantly enters one marathon and waveringly decides to try a second. Havoc holds the world record for dancing: 3,400 hours. 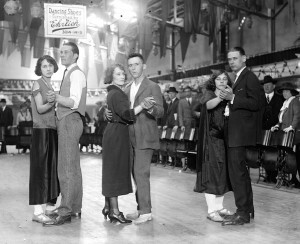 As veteran director Terry Donald notes, these dance marathons originated in the Roaring Twenties as an amusing fad but turned dark with the years of unemployment. Gangsters corrupted the process, contestants sabotaged each other, fights ensued. The show began with Yip Harburg’s iconic 1932 Brother, Can You Spare a Dime? A six-piece band provided music of the era as 40 students pranced and stumbled their way to dropping out as they competed for coins thrown on the floor by gambling viewers. Cameos of contestants from different backgrounds added texture to the script. Hayley Kerber was perfect as June; Ezra Fama-deSmit as Patsy, her assigned dance partner, had an insouciant manner that balanced her earnestness. Cedric Roy as Mr. Dankle, the smooth promoter, and Veronique Breton as Melba Marvel, the celebrity slummer, captured their roles, as did Michael Nangreaves as Ruddy, and Naomi Du Vall as Evie, Dankle’s efficient but sympathetic assistant. Marathon ’33 draws comparison to the 1969 film They Shoot Horses, Don’t They? That film, with Jane Fonda, was based on a 1935 novel. Fonda’s then-husband, Roger Vadim, persuaded her to accept the leading role,as he felt the marathon dance craze was relevant to existentialism. Havoc acted with such greats as Gregory Peck and Richard Burton. Be the first to comment on "John Abbott dancers cry havoc with production of Marathon 33"